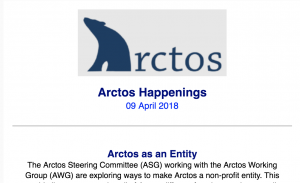 The April 2018 Arctos newsletter covers new updates such as exploring ways to make Arctos a non-profit entity, new collection spotlight, and project updates from the Arctos Working Sub-Groups. To view the newsletter, click here. The Arctos Working Group in collaboration with the Arctos Steering Committee will be putting out a quarterly Arctos newsletter. To view the January 2018 newsletter, click here. Make sure to join the Arctos google group (arctos@googlegroups.com) to receive quarterly Arctos newsletters, Arctos outage and update notices, webinar announcements, and more delivered directly to your inbox! This webinar will provide an overview of how Arctos captures and connects information with Projects, Publications, and Citations. These features help track specimens and collection objects for the entirety of their lives, from acquiring project funding to being used for cutting-edge research 50 years in the future. Presenters: Michelle Koo (Staff Curator, Museum of Vertebrate Zoology, University of California, Berkeley), Jon Dunnum, & Mariel Campbell (Collection Managers, Museum of Southwestern Biology at the University of New Mexico). Abstract: Arctos is a community of museums that collaborate to manage and host their data online. Over 3 million records are publicly available at https://arctos.database.museum, a searchable biodiversity database for scientific research, resource management, and education. The Arctos database is used both for querying museum records (see webinars 1 and 2) and for managing information about the collections. This webinar will provide a short introduction to how transactions (accessions, loans, and permits) are managed in Arctos. Topics will include collection-level permissions and the basic tools for creating and updating different kinds of transactions, managing agents, and linking transactions to projects and media. Presenter/s: Carla Cicero and Michelle Koo (Staff Curators, Museum of Vertebrate Zoology, University of California, Berkeley). In case you missed it, the second webinar on Basic and Advanced Searching in Arctos was held on Tuesday, October 10th. Watch the recordings of the first two webinars on YouTube! 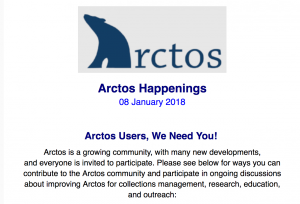 Please join us next Tuesday for a webinar Introduction to Arctos as a Collection Management System and as a Community! Carla Cicero (Staff Curator of Birds, Museum of Vertebrate Zoology at the University of California, Berkeley) & Mariel Campbell (Collection Manager, Museum of Southwestern Biology at the University of New Mexico) will present a live demo of Arctos with time for questions and discussion at the end. Can’t make it next week? Check out our upcoming monthly webinars. Check out our gold standard records. These highlight how Arctos data are linked to projects, publications, GenBank, and related specimens or media. If you have a favorite Arctos record, contact us with a link to the record and why it’s worth featuring. It is often useful to first perform a general search, then “search within results” to incrementally explore specimen data and reduce the results set. Sorex yukonicus currently returns 34 specimens. At the top of the results page, click “show/hide search terms.” A form will appear. Use the “add a row” select to add more criteria. We’ll add ID Type…. which will create a new row in the form. Enter an appropriate value, click requery. 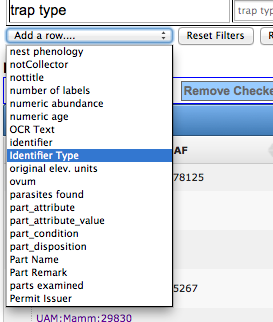 (The select list will help determine appropriate values.) The page will reload to Sorex yukonicus with GenBank numbers. Perhaps we want Sorex yukonicus with GenBank numbers from the Seward Peninsula. Adjust the map until only the area of interest is visible, and click “QueryByViewport” to push the coordinates visible on the map to the form. Requery again. The page will reload with the selected specimens, and the map zoomed (approximately – sometimes VERY approximately! – due to Google Maps API limitations) to the area queried. The “requery” widget can also be used to expand search. Perhaps we’d now like to find ALL specimens with GenBank sequences from the Seward peninsula. Simply click “clear” on the Identified As row and click requery. Or perhaps we actually want everything with a GenBank sequence that MIGHT be from the Seward – things with a maximum coordinate uncertainty intersecting our viewport. Change QueryByError? to true and click requery. It may be necessary to zoom out on the map to see the results – some specimens have very large (hundreds of kilometers) errors.